Tamarindo used to be a small fishing village on Costa Rica's northern Pacific coast and part of the Guanacaste Province. It has since evolved to a bustling vacation hot spot for American and European tourists alike. Tamarindo is surrounded by natural attractions such as the Marino la Baulas National Park, the Diria Wildlife Refuge and some mountains with breathtaking views over the ocean. 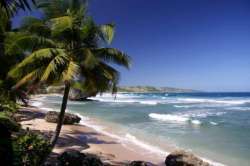 Its beach is a three and a half kilometer stretch of white sand and warm blue water. Tamarindo is Guanacaste's best known destination; well developed with a big choice of hotels and resorts, and plenty of shops, restaurants and a great selection of bars and clubs. There is something for every budget and it is easy to reach. Nature is abundant and leather back turtles lay their eggs in the northern part of the bay. Howler monkeys, migrant birds, and all kind of exotic wildlife live in Tamarindo's surroundings. Tamarindo is also one of the most popular beaches for surfers. It is important to remind tourists, that its beach has strong rip currents and barely submerged rocks. Swimming in the warm ocean, snorkelling, sailing, kayaking, boogie boarding, horseback riding, scuba diving or just relaxing are some activities that visitors can enjoy in Tamarindo and the beaches which are close-by. Walking on the trails of the nearby Diria Wildlife Refuge and Marino las Baulas National Park (where leather back turtles come every year between October and March to lay their eggs) is an amazing experience. The estuary to the north separates Tamarindo from Playa Grande, and you can rent canoes can to explore it by yourself.